Leaves are alternate compound with five to nine leaflets. 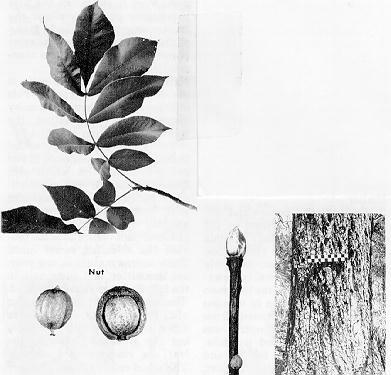 The mockernut hickory is a tall, short-limbed tree with a narrow crown and upright branches. It is found quite generally in the eastern part of the United States as far west as Kansas and Texas. The pinnately compound leaves have five to seven leaflets which are broader toward the tips and more wedge-shaped toward the base than the leaves of the other hickories. The leaflets are yellow-green and glossy above, pale to orange-brown beneath, with soft, velvety surface. They turn a beautiful yellow in the fall. The oval, slightly pear-shaped fruit has a thick, strong-scented husk, which splits nearly to the base when ripe. The nut is reddish to dark brown, with a thick shell and small, sweet kernel. On older branches the bark is light to dark gray and on the trunks it breaks into broad, shallow and somewhat platelike ridges that are not shaggy.